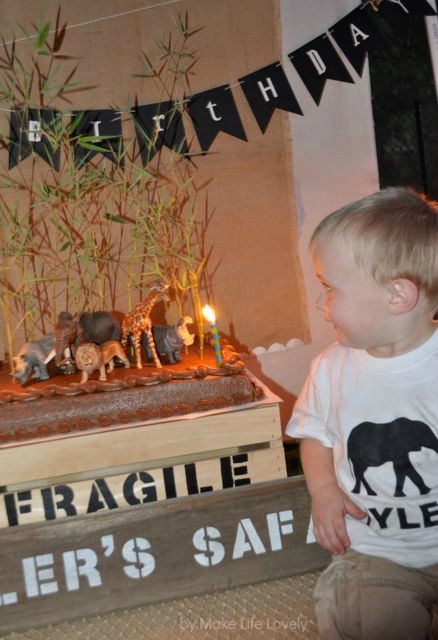 Last month we celebrated my son’s second birthday by putting together a Jungle Safari birthday party. 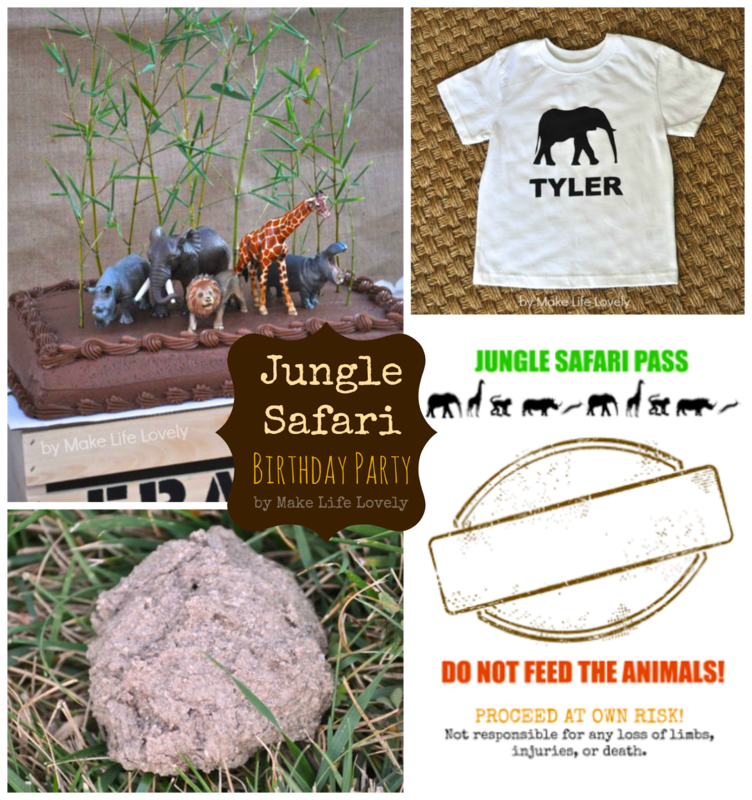 Yesterday I shared with you the decorations and the food of the jungle safari birthday party (which you can read about HERE), and today I’m going to show you some of the activities, the cake, and more! I’m even giving you a free printable for you to use if you choose to use this theme! The whole time the party was going on I had some awesome jungle animal sounds I found on iTunes playing on the outdoor speakers to make it seem like the kids were really in the jungle. This party had a few different parts to it: eating, playing the game, cake, and then watching a movie outdoors on the big screen. The first game I planned was pretty funny, if I do say so myself! Have you ever heard of treasure stones? Basically you make a dough out of used coffee grounds (thanks Starbucks! ), flour, salt, and a few other ingredients, roll it in a ball shape, place a toy in the middle, and bake it. It turns hard on the outside, but is still pretty easy to break open and find the prize. I shared the recipe and directions here if you’d like to make your own! It was hilarious watching their faces as I told them that they were going to do “scientific research” in the jungle, and they had to hunt around the yard for elephant poop! Priceless. 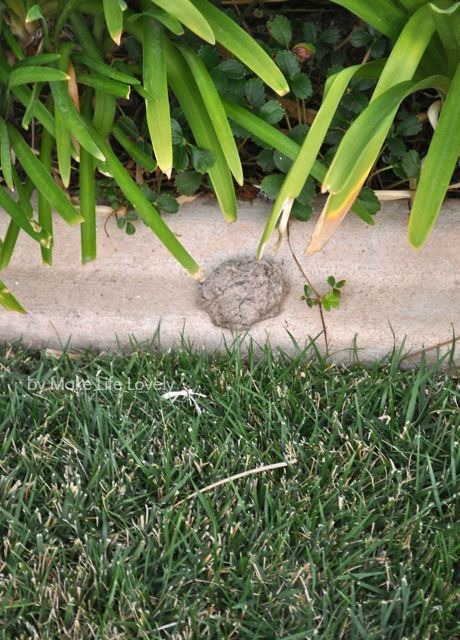 Once they got over the initial shock of it, they actually had fun searching through the grass and plants for it. 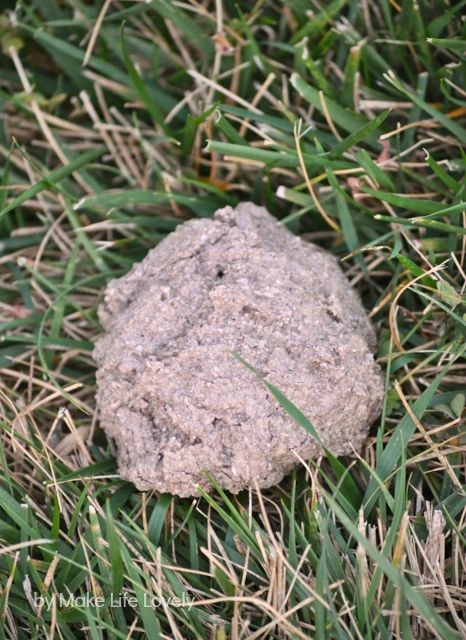 When they found their treasure stones (aka elephant poop) they could break them open, and keep the treasures hidden inside. I baked bouncy balls, plastic lizards, frogs, and snakes, and sparkly rings for the girls inside. One of the games I had planned (but we ran out of time) was an animal sounds identification game. I downloaded a CD from iTunes that had specific animal sounds for each track. I made a CD out of the tracks, made up a sheet with numbers printed out on it, and was going to have everyone guess what animal was making the sounds on each track. 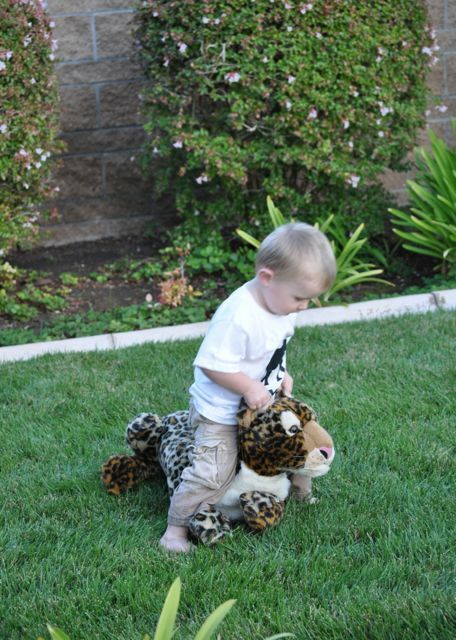 The game was trickier than it sounds, because some of those animal sounds were hard to figure out! Unfortunately, we weren’t going to have enough time to show the outdoor movie, so I just skipped over the game. I had intended on making a homemade cake, but since I put together this whole party in just ONE week, I ran out of time and bought a chocolate sheet cake from Costco. I had them leave off the colored roses and balloons, and just leave the cake plain with the chocolate border piped on. This gave me a blank slate to work with. 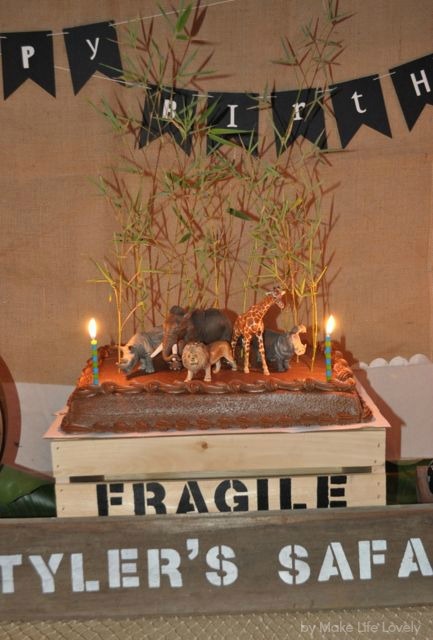 We have about a gazillion of those amazingly realistic Schleich animal toys, and so I pulled out some of the jungle animals that matched the theme and put them on the cake. 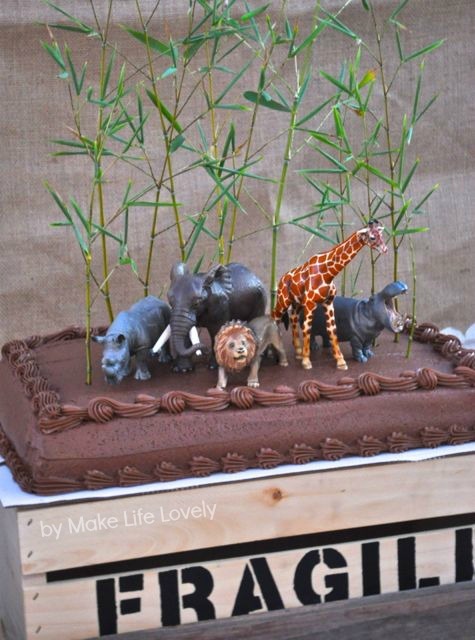 I also cut some small pieces off the bamboo that I showed you yesterday, and stuck them right in the cake. So simple, and yet I love the way the cake looked. 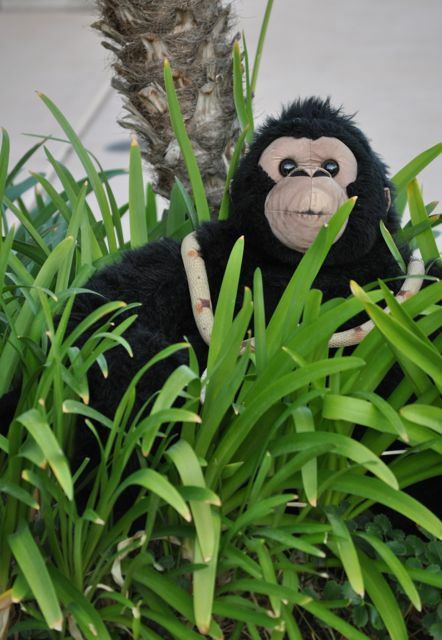 We have tons of big stuffed animals that I put out in the yard for the kids to play with- a huge long crocodile, a big leopard, two gorillas, some monkeys, and plenty of snakes. Love the above picture- no shoes, dirt on his shirt and face, and looking like such a little boy! 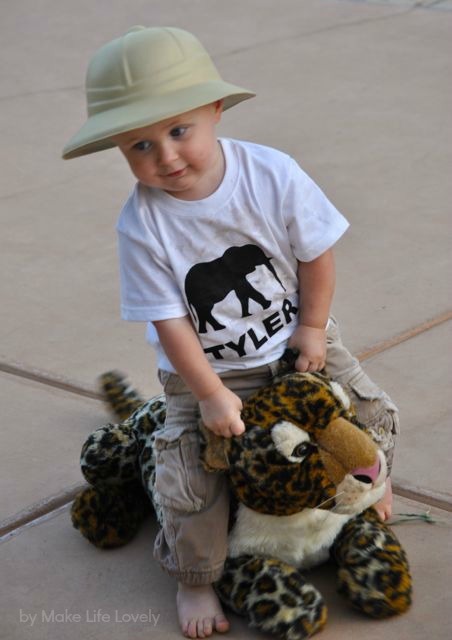 I wanted my son’s outfit to look safari-ish, so I found some kids safari pith hats for my kids. 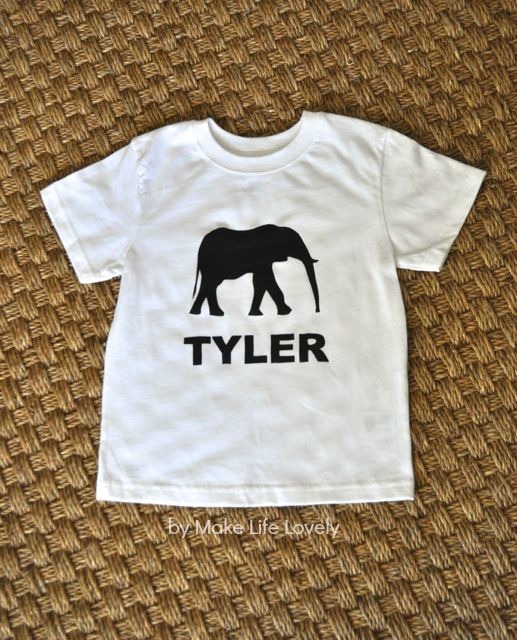 He wore khaki pants and a shirt that I made with his name and an elephant on it. I used freezer paper and created the design, and then stenciled the design on his shirt. Easy, but so cute! I think I’ll do a tutorial for this technique in the near future, too! 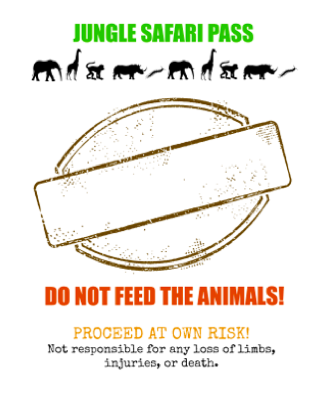 Remember the jungle safari party passes I created that I showed you yesterday? I made some cute passes that they kids were given when they got to the party to go around their neck. I’m giving them to you as a free printable!! 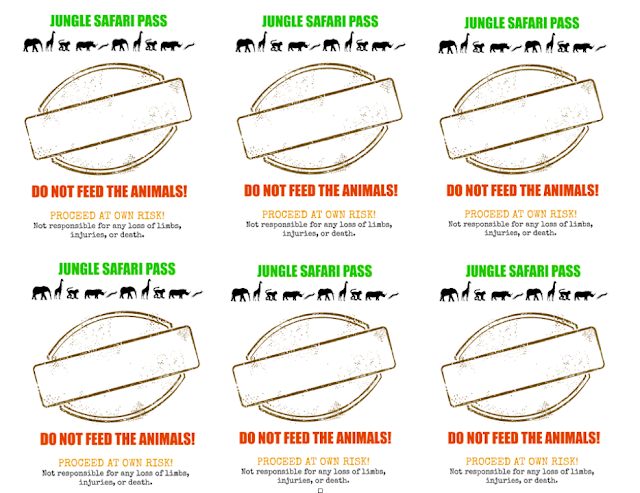 Just click on the link below to take you to Google docs, where you can download the free jungle safari passes for the little explorers to wear. There are 6 passes to a sheet. 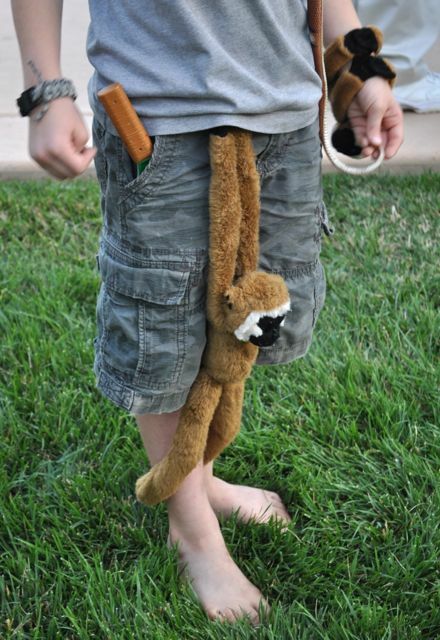 All you have to do is write in each child’s name, cut them out, and add string! Here’s a little tip for putting together the passes. Instead of taking the time to punch holes, tie knots, etc., all I did to attach the string was a quick dab of hot glue on each top side of the pass. I stuck the string right on the glue, it dried quickly, and it was nice and easy! Also, I had them printed on a cream card stock, instead of white. We had such a fun time celebrating my son’s birthday with this party. Thanks for letting me share with you! If you have any questions of comments about the party, be sure to leave a comment below! 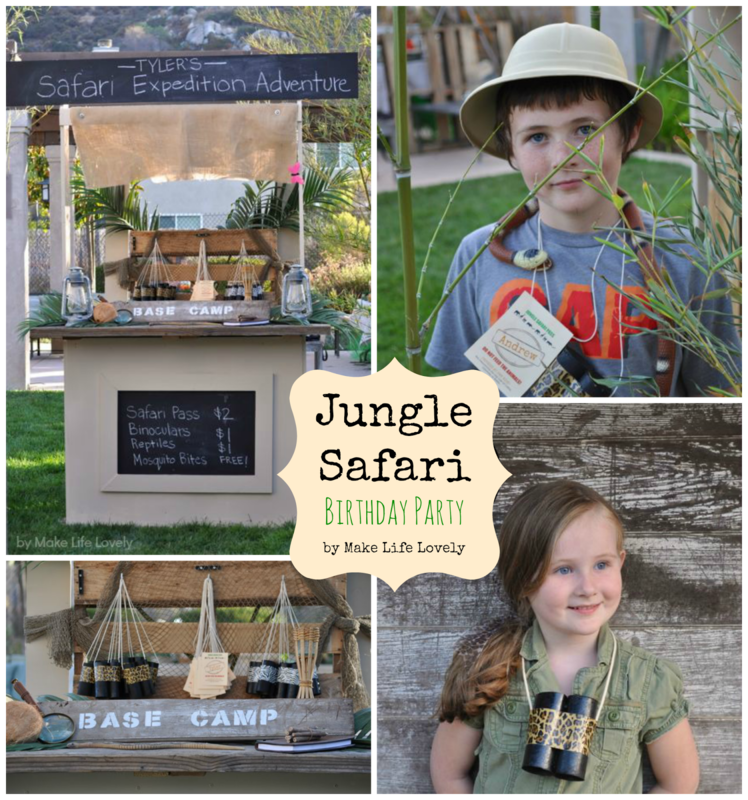 And if you missed my first post about the jungle safari party, where I go into detail about the food, decorations, and more! Be sure to check it out HERE. 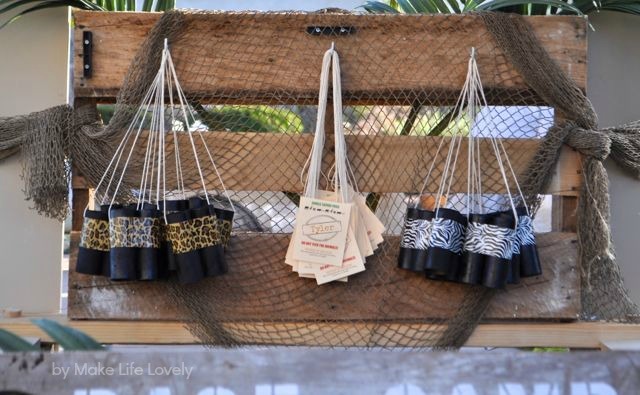 You can learn how to make easy party favors binoculars from toilet paper rolls and duck tape HERE. So fun Laura! 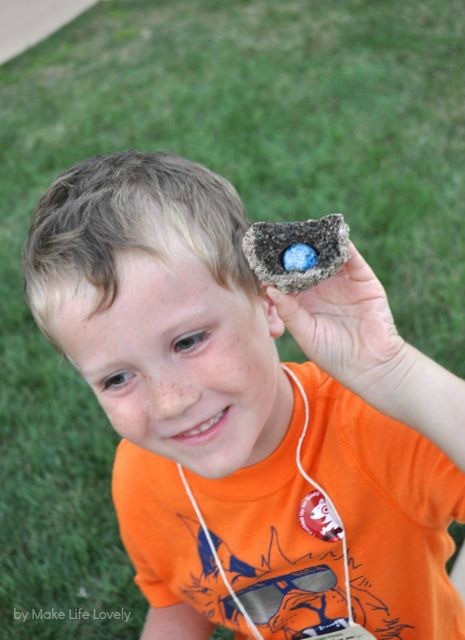 Very interested in your treasure rock tutorial. My first thought was that putting something plastic inside would melt so I’m excited to see how you did it. Haha, thanks!! I had a lot of fun putting this party together for my little guy. Everything looks adorable! You did a great job with decorations! Thanks so much Lisa! I had one week to put it all together, and am pretyy happy with the way it turned out. My only regret is not taking more pictures during the party! 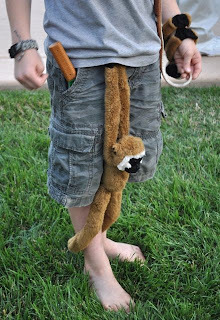 You’ve inspired me for my soon-to-be 5 year old son’s birthday … so many fantastic ideas, and beautifully styled! Do you have a printable (or can give me some tips) for the fabulous bunting you’ve used please? This is SO awesome, I am in awe! You’ve definitely inspired me for my son’s upcoming 1st birthday. I always wanted to do a safari theme and after stumbling across your site, I’m super excited to plan it! Thank you!! Great, I’m so glad I could inspire you Rochelle! That makes my day. Good luck with your party, I’m sure it will be great!